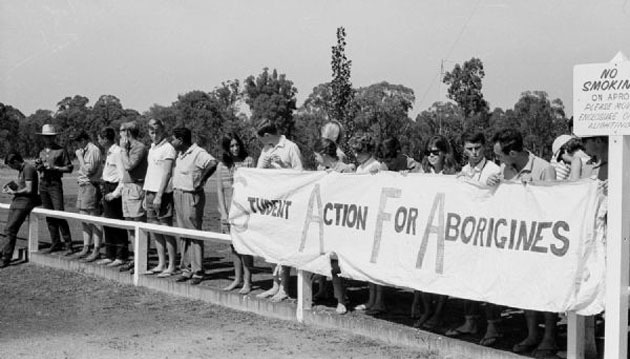 This month marks 50 years since the historic Freedom Ride, when a group of 30 students, led by Sydney University’s first Aboriginal graduate, Charles Perkins, exposed the extent of racial discrimination in NSW country towns. To commemorate the anniversary, over 100 Sydney University students, staff and alumni will re-enact the bus trip, visiting some of the towns from the original ride. Unlike the 1965 ride, which was entirely organised by students, the re-enactment has been arranged with much fanfare by the university administration in collaboration with Rachel Perkins and won’t be exposing the rampant discrimination that still exists. However, the original ride provides an inspiring example of anti-racist activists exposing and physically confronting apartheid in Australia. The Freedom Ride came at a time when awareness of, and resistance to, racial oppression was on the rise across the world. Opposition to apartheid in South Africa and the civil rights movement in the US were making headlines. Australian students were deeply affected. After the 1960 Sharpeville massacre in South Africa over a thousand students demonstrated in Sydney’s Martin Place. In May 1964 a demonstration by Sydney University students in solidarity with US civil rights protesters set off events that would result in the Freedom Ride. The American civil rights movement got students questioning the segregation and oppression of black people in Australia. A new organisation, Student Action for Aborigines (SAFA), was formed. The influence of the US civil rights movement is evident in SAFA’s decision to call their tour a “Freedom Ride,” borrowing from the 1961 US student campaign to desegregate inter-state bus lines and terminals. They decided to organise a bus tour of regional NSW towns to survey the conditions of Aboriginal people and use tactics like picketing and demonstrations to desegregate the towns. The towns the students chose to visit were particularly marred by profound racial division. Across the country state-based Protection Boards wielded absolute power over Aboriginal people held captive on reserves. They controlled their movement, property, money and relationships—even who they were allowed to marry. The genocidal removal of mixed-race children from their families was still in full swing. The dominant assimilation policy of the time dictated that Aborigines should leave the stations and reserves on which they had been confined and settle in towns like ‘other Australians’. Between 1938 and 1964, Aboriginal reserve land in NSW had shrunk from 15,000 acres to just 1500. However resistance from town councils and residents meant that many Aboriginal people were forced to live a marginal existence in shanty towns along rivers and near garbage tips. They were deprived of housing, sewerage systems, clean water, electricity and other town services. Students noticed a sign above the doorway at the hotel in Dubbo that read, “Aborigines not allowed in the Lounge without Licensee’s permission.” At Bowraville, perhaps the worst of the towns, the cinema had a physical partition and separate doors so that whites never had to lay eyes on an Aborigine. School buses, and even the cemetery, were segregated. Walgett was notoriously racist. There had already been protests by its Aboriginal community over the jailing of two nine-year-old Aboriginal children in mid-1964 for stealing crayons and ping-pong bats from a church. The boys’ mothers replaced the stolen items, but subsequently, the children were removed from their families to foster homes due to “bad housing.” This travesty shocked progressive opinion. In July a delegation of Aboriginal and non-Aboriginal unionists arrived in Walgett to investigate the children’s treatment. They reported that, “perhaps the most important event of our trip was a meeting of 100 Aborigines on the Sunday, who, after listening to our delegation, elected a committee to protect their interests.” Harry Hall, a shearer in the AWU, became president of the Walgett Aborigines Progressive Association, which emerged from this meeting and included white supporters. The Freedom Ride arrived almost totally ignorant of this earlier activism. Their target was the RSL (now the Returned Services League), “the great sacred cow at that time…the most cherished institution in Australia,” as Perkins put it. The RSL barred Aboriginal ex-servicemen from membership. Local Aboriginal people joined the protesters in arguing with white hecklers. Following the demonstration they were asked to leave the church they had been staying at and departed Walgett early. Anticipating trouble, a convoy of sympathiser’s cars, including Aboriginal people—accompanied them out of the town. Despite these precautions a utility driven by a local grazier’s son sped past the convoy and began to ram the bus, eventually running it off the road. Miraculously, no one was hurt. The drama at Walgett guaranteed that national—and some international—media would follow the rest of the Freedom Ride intently. Trying to deflect the scrutiny, the Premier, Jack Renshaw, absurdly denied the existence of serious racial discrimination in Walgett! Moree’s crowning glory was its artesian baths, attracting thousands of tourists a year. But, the Aboriginal population was strictly excluded. The town council had even passed a motion barring Aborigines from the baths and town hall. The students brought six Aboriginal children to the baths for a swim but were refused entry. They began picketing, and after heated argument with the pool manager the children were allowed in. However, after they left Moree, news arrived that the Moree baths were again off limits to Aboriginal children. The students turned around to re-apply the pressure. Locals greeted their return with intense hostility. Local graziers gave shearers the afternoon off to vent their opposition to the students, while railway workers were granted a similar privilege. A Moree sympathiser “was grabbed by local youths when he arrived at the pool. He was carried bodily to the front of the pool and dumped in a gutter.” The hostile crowd grew to 500 and began pelting eggs and rotten tomatoes. The students had their hair pulled, received cigarette burns and were spat on. But their determination paid off. At a crisis meeting with the students, the Mayor vowed to rescind the discriminatory motion barring Aboriginal people from the pool, if the students left town immediately. Claiming victory, the students ended the picket. By commanding front-page publicity, the Freedom Ride put Aboriginal rights squarely on the national agenda. The oppression of Aboriginal people could no longer be swept under the carpet. Finally, the Freedom Ride was a shot in the arm for the referendum campaign, contributing to its success in 1967. The Freedom Ride received enthusiastic support from trade unions. The Waterside Workers’ Federation (WWF) had actually offered support before they set out, in the form of a speaker system and an organiser to accompany them. But they were rebuffed because Charles Perkins didn’t want to be associated with a Communist-led union, thinking this would jeopardise sympathetic media coverage. Perkins initially tried to prevent Communist students from joining the Freedom Ride too. But it was the Left that were the most enthusiastic supporters of Aboriginal rights. Left-wing unions, and in particular the WWF, had been materially supporting Aboriginal rights for years. Many more respectable groups at the time shied away from taking up the fight against racism. Despite Sydney University’s efforts to claim the legacy of the Freedom Ride today, the original ride received no official university support. In the end, about a third of the Freedom Riders ended up being from left-wing organisations like the Labour Club and the Communist Party. While formal discrimination was largely abolished in the 1970s, it was shamefully re-introduced with the Northern Territory Intervention in 2007. Across the country the social position of Aboriginal people remains dire. Most of the problems observed by the Freedom Riders, shamefully, persist 50 years on—inadequate housing, water and medical services, police harassment and child removal. Just last September at Moree, which the Freedom Ride made a byword for racial segregation, Aboriginal family members were handcuffed as their children were taken at gunpoint by riot police. With Aboriginal people still treated as second-class citizens, the original Freedom Ride points to the kind of militant action that is needed again, today.